Greetings again from the darkness. Historical dramas, by definition, carry added depth and weight to stories that sometimes seem almost beyond belief. Such is the true story of the 1960 Mossad mission to capture Adolph Eichmann, the noted architect of the Final Solution, who was hiding in plain sight in Argentina. You might think there have already been enough Holocaust movies, but director Chris Weitz (ABOUT A BOY) hones in on the personal aspects of loss and anger, and the need for justice. 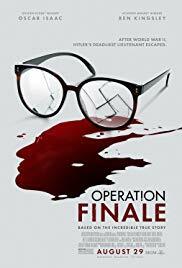 Matthew Orton’s first screenplay benefits greatly from a terrific cast, especially the two main characters played by Ben Kingsley (Adolph Eichmann) and Oscar Isaac (Mossad agent Peter Malkin). Sir Ben is notably restrained in his performance of the last surviving mastermind of the Holocaust, and one of the most despised men on the planet. His subdued performance aligns perfectly with the “ordinary” man of which we’ve since read. Mr. Isaac adds the element of psychology in his “good cop” approach to getting Eichmann to crack. Playing much like a heist movie, we see the team assembled and the quite convoluted plan devised. The high risk strategy underscores the desperation so many felt in their need to see Eichmann pay for his atrocities. The manhunt required some political tip-toeing, and we even gain a history lesson on the role of the Catholic Church. A tip from a “secret” Jewish daughter (Haley Lu Richardson) and her father (Peter Strauss) set things in motion. Sylvia (Ms. Richardson) actually dates Klaus Eichmann (played by Joe Alwyn), who is a picture-perfect Aryan carrying on the horrid Nazi tradition of hatred. Of course, Klaus is the son of Adolph, and the one who spills the beans about his father being “a big deal” in the war … thereby ruining the quiet and mostly unassuming life they have been living with Adolph’s wife (a nearly unrecognizable Greta Scacchi). Sylvia and Klaus meet at a movie when she shushes him and his friends. Director Weitz even includes a clip of IMITATION OF LIFE (1959), a film that not coincidentally stars his mother, Susan Kohner. It’s a nice touch. Much of the film takes place in the safe house where Adolph Eichmann is blindfolded and spoon-fed. It’s here that the psychological games and political maneuverings begin. Supporting actors who add strength to the film include team members Melanie Laurent (Hanna), Michael Aranov (chief negotiator Zvi), Lior Raz (as the demanding team director), Nick Kroll, and Simon Russell Beale (as Prime Minister David Ben-Gurion). There is a history of bumpy romance between Hanna and Peter, though it adds little to the story. Alexandre Desplat’s score is terrific, especially during a creative and informative opening credit sequence. “Who did you lose?” is a recurring question throughout, as it’s 1960 and everyone involved lost someone – a driving force behind their persistence and commitment to the cause. The film is focused on the mission to capture, not the details of the subsequent trial; however it does close with archival photos of the actual trial – adding historical relevance to this fine dramatization.